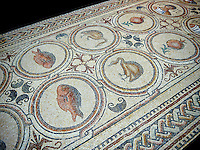 The Roman loved mosaics and used them extensively on the floors of their villas and public buildings. 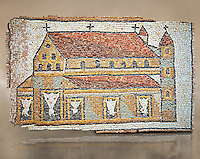 It is no surprise then that the Eastern Byzantine Roman decorated the inside of their churches with mosaics. 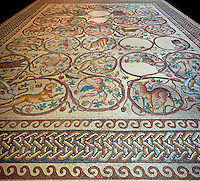 The earlier pagan Romans depicted stories from Greek mythology in mosaics panel and the Christian Eastern Roman Byzantines depicted scenes from the life of Christ in mosaics on its church walls. Eastern Roman Byzantine church design evolved from Roman Basilicas which were civil spaces used for public debates and trials and functioned a little like town halls. Byzantine churches had semi circular apses above their altars which were the focal points for the congregation. A popular depiction in the Apse was that of Christ Pantocrator or in majesty. Jesus Christ is depicted in an eye shape panel call a madorla as if appearing from heaven. In his left hand he hold the testament and his left hand is raised to bless the congregation. His fingers make the shape of the Greek letter Chi Rho, which are the two starting letter of Jesus Christ in Greek. Below this depiction of christ on the curved wall behind the altar is usually depicted the Virgin Mary flanked on either side by the Apostles. The background of these depictions is traditionally gold as are all of the other depictions that cover the walls of Byzantine orthodox christian churches. With small windows the mosaics inside these churches would have been hardly visible until the candles were lit for services. The mosaics would have taken on an almost 3 dimensional character as the dancing flames of candles illuminated them, creating a magical space that is difficult to appreciate with modern electrical lighting. 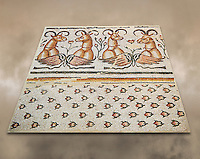 The skill of the Byzantine mosaic artist was immense and his ability to create subtle mosaics that depict religious scenes reached its height at the places like the Palatine Palace in Palermo and in the mosaics that survived in Hagia Sophia in present day Istanbul.